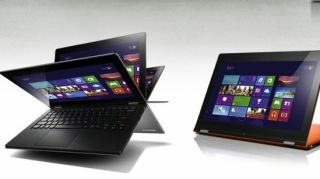 Lenovo is IdeaPadding its pockets thanks to a sharp increase in the company's tablet shipments during the fourth quarter of 2012. Shipments of the IdeaPad and ThinkPad line represented an "almost 80 percent year-to-year growth," according to Lenovo CEO and Chairman Yang Yuanqing during a conference call today. The more than 800,000 tablets shipped by Lenovo contributed to the US$9.4 billion (around £5.95 billion, AU$9.03 billion) in total fiscal third quarter sales for the Chinese manufacturer. "We will continue to have hyper growth in smartphones and tablets," Yuanqing said of Lenovo's best quarter ever. The accelerated growth of Lenovo's IdeaPad tablet line is significant because the company's first IdeaPad tablet, the Lenovo IdeaPad K1, came out just a year and a half ago. Since then, it has launched additional Android and Windows-powered tablets meant for consumers rather than business professionals like its Thinkpad line. The Lenovo IdeaTab S2110A and the IdeaTab A2109 released in 2012 and have been joined by new arrivals the IdeaTab K3011 and Ideatab A2107 this month. Lenovo Blackberry bid in motion? Lenovo is now China's second-largest smartphone and tablet provider and the world's third largest maker of "smart connected devices." Its 13 consecutive quarters as one of the fastest-growing PC companies has led to rumors that Lenovo might buy struggling smartphone maker Research in Motion, recently rebranded as Blackberry. Some have speculated that it's too late for a Blackberry rebound, but Lenovo could end up being what saves BlackBerry more so than Blackberry 10. Plus, the company was able to take over IBM's personal computer business in 2005 and turn a healthy profit, as evidenced by today's earnings report.